According to the analysis done by Persistence Market Research, the global vacuum salt market is experiencing steady rise since the past few years. The global market has witnessed positive yet slow growth since 2012 and is expected to register a CAGR of 3.4% throughout the period of forecast. In 2017, the global vacuum salt market reflected an estimate of around US$ 5600 Mn and is anticipated to touch a value higher than US$ 7 Bn by the end of the year of assessment. This growth can be attributed towards the rise in the production of processed food and beverage products, steady demand from the water softening industry, increasing production of processed and preserved meat products and expanding production of chlor-alkali products. 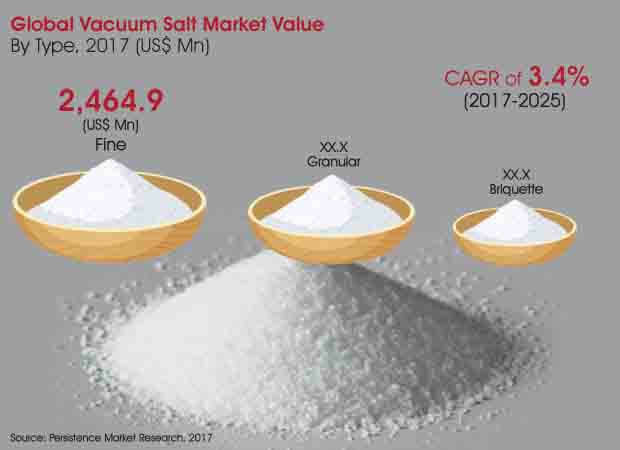 However, the advent of salt replacers, seasonality of de-icing products and premium pricing of vacuum salts are challenging the growth of the global vacuum salt market. By type is one of the main categories of the vacuum salt market. The type category is segmented into granular, fine and briquette. Of these, the fine segment is expected to be the largest in terms of market value. The fine segment led the global vacuum salt market during the 2012-2016 timeline and is likely to retain its status quo in the coming years. By end of the assessment year (2025), this segment is expected to have a high market share and is estimated to reach a value of more than US$ 3100 Mn from a value of around US$ 2400 Mn in 2017 and is projected to grow at a value CAGR of 3.3% throughout the period of forecast. Briquette segment in the type category is anticipated to be the fastest growing segment, yet reflects less valuation. This segment is projected to rise at a value CAGR of 3.8% during the period of forecast, 2017-2025 to touch a value of a bit over US$ 1 Bn by the end of the year of assessment, from a value of around US$ 872 Mn in 2017. In North America and Europe, the fine segment is the second largest with a significant market share. On the contrary, the granular segment is expected to reflect high potential for growth of the global market. Briquette segment in the North America vacuum salts market is projected to grow at a relatively higher pace during the forecast period. Fine segment in the Europe vacuum salt market is estimated to touch a valuation of around US$ 440 Mn by the end of the year of assessment. The Latin America vacuum salt market growth rate is influenced by the high value CAGR of the granular segment that is expected to touch more than 4% during the assessment period. In Asia Pacific vacuum salt market, the fine segment is almost double in market valuation than that of the granular segment. The briquette segment in the Asia Pacific vacuum salt market is projected to grow at a moderate value CAGR of 4.6% throughout the period of forecast.